Varicose veins and spider veins generally affect the legs, feet, and hands. Laser vein removal is a non-surgical procedure with little downtime and minimal side effects. While phlebectomy is still sometimes necessary for very large varicose veins, smaller blue and red veins – particularly spider veins – respond well to laser vein removal therapy. The advantages of laser therapy are many: the avoidance of surgery and anesthesia, relatively short procedure times, minimal downtime, and minimal side effects. Since lasers are noninvasive and can reach smaller areas, laser vein removal is the procedure of choice for broken capillaries on the face. 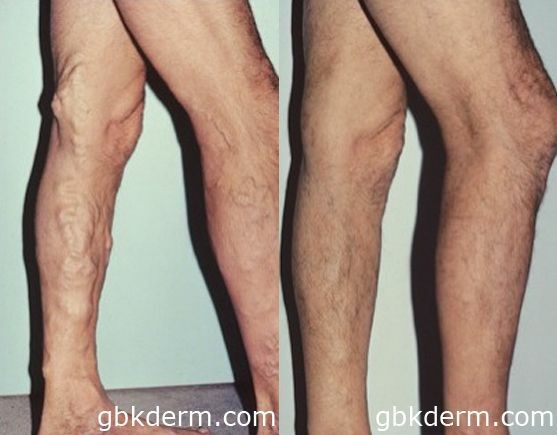 For varicose veins and spider veins on the legs and body, sclerotherapy is considered the gold standard, but in cases where sclerotherapy is not appropriate (such as on the face), laser vein removal is very safe and effective. Laser vein removal is a great option for eliminating the appearance of unsightly veins, most notably varicose veins and spider veins. Varicose veins usually develop in the body’s surface network of veins, where they are not well supported by muscles. Although there is sometimes a hereditary component, varicose veins are usually caused by excessive pressure on the limbs, such as that exerted by obesity, pregnancy, or long-term standing. Pressure on the vein from increased weight or stress weakens the valve that pushes blood through the vessel wall and prohibits its backflow. When the valve cannot work optimally, blood pools in the vein rather than flowing through it, causing bulging and torquing. Interior veins more rarely become varicose, resulting in swelling, aching and possibly blood clots. Spider veins, or telangiectasias, are broken capillaries that can appear on the face, legs, and feet. Dr. Mitchel Goldman, the founder and Medical Director of Cosmetic Laser Dermatology in San Diego, has a worldwide reputation as an expert on laser vein removal. Both he and the other doctors at our practice have been instrumental in researching and developing techniques for nonsurgical laser vein removal that require almost no downtime and have minimal side effects. Learn more about varicose veins and laser vein removal at webmd.com. If varicose veins and spider veins are not working properly, the aim of treatment is to remove them so that the blood re-routes itself into well-functioning veins and capillaries. Depending on how many veins need to be treated, each laser dermatology session may only take a few minutes to an hour or more to perform. Some patients receive optimal benefits after just one session, while others may need between one and four follow-up vein removal treatments. Only a local anesthetic is needed to numb the treated area. After your leg vein consultation at Cosmetic Laser Dermatology, our skincare specialists can determine which vein removal treatment is right for you. 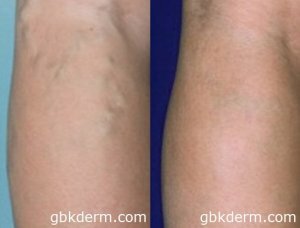 Our San Diego facility offers the following treatments to reduce and eliminate the appearance of pesky varicose veins and spider veins. CoolTouch CTEV is a long-pulsed Nd:YAG laser that uses 10 W of energy, a wavelength of 1320 nm and a pulse duration of 600 ms to target and remove veins that are less than an inch wide. It is an ablative technique, which means it actually destroys the malfunctioning veins. It accomplishes this by evaporating the water in their walls, instantly collapsing them. CoolTouch CTEV can be used to treat multiple areas, including the calves, thighs, and knees. Because it targets water rather than hemoglobin, as do some other lasers, it is well tolerated. Patients report minimal to no pain or discomfort. The laser dermatology procedure has a 99% efficacy rate. CoolTouch CTEV typically has few side effects and no downtime. You can return to your daily activities directly after vein treatment. You will be given a compression garment to protect your leg for the first few days after treatment and to minimize subsequent bruising or soreness. Some patients may have also slight scarring. These typically resolve within a few days or weeks. The CoolTouch Varia laser can eliminate broken capillaries around the nose, under the eyes, and on the temples and other areas of the face. It is specifically designed solely for reduction of green, blue, and purple veins on the face, and is very effective with no downtime and minimal side effects. You can see the veins disappearing as the laser targets them, and generally, only one session is required, although for larger or more numerous veins more than one session in Del Mar may be necessary. The Vbeam laser can treat a number of skin problems, including acne, age spots, and rosacea. It is also used to treat telangiectasias on the face, legs, and ankles. The Vbeam’s dynamic cooling device sprays an evaporative cooling solution before each pulse, which helps minimize patient discomfort. Possible side effects include temporary discoloration or reddening of the laser vein treatment site. These will typically resolve within a few days to weeks.